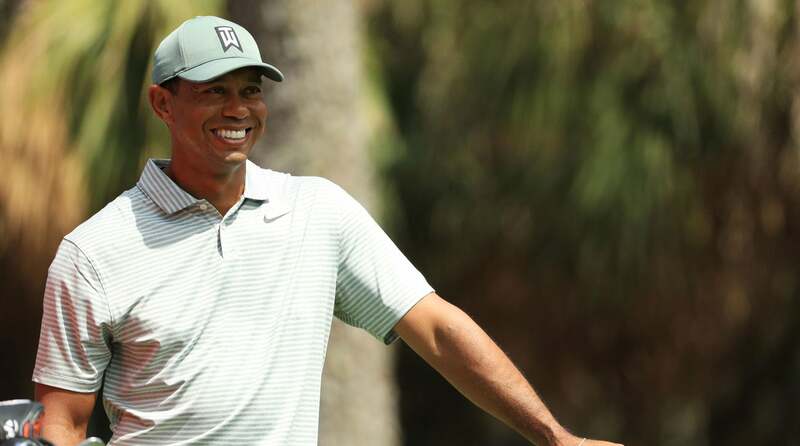 PONTE VEDRA BEACH, Fla. – When it comes to Tiger Woods, everybody is an expert, but some people are more expert than others. Woods began his Thursday round trailing the leader, Tommy Fleetwood, by seven. Yikes! And after going out in 36, here at the Stadium Course, he still trailed by seven. And then Tiger made the long walk to the 10th tee, his gait perfect, dressed beautifully in various shades of olive, looking like a man who did not have a care in the world. One of the most knowing men in all of golf — a true expert — was watching the 43-year-old golfer with his trained eye. Can a kindler, gentler Tiger still win? Well, those days are over. Woods is the captain of this year’s American Presidents Cup team. A whole cadre of young players – Justin Thomas, Bryson DeChambeau, Jordan Spieth, Harold Varner, even 30-year-old Rickie Fowler – hang on his every word but can give him the needle, too. The last time he had this one-of-the-guys quality, was probably when he was playing college golf at Stanford, half his lifetime ago. These days, he’s both an old man and a young man. He’s still a very good golfer. All of golfdom saw that last year, when he contended in Tampa, at the British Open and the PGA, and when he won at East Lake. But there was one troublesome aspect to even his best golf last year. He played some of the most beautiful iron shots you’ve ever seen. He pitched the ball well. He didn’t putt as he did in his prime but he wasn’t at all yippy. The troublesome thing was the driver. Woods started hitting driver in play last year when the afternoons were warm and he could hit a rip-and-hold driver that would do nothing but fade. The swing was distinctly different from his iron swing, with no release and none of that curved-spine finish that you associate with super-athletic players like Dustin Johnson. The swing was an accommodation to his fused back that will not shake, rattle and roll as his circa 2000 back would. Last year, Woods had a shaft and a driver head that was designed to let him swing hard, start it down the left and hit fades. You can make a nice living that way (Woods earned $5.4 million), but you have almost no chance winning at Augusta hitting nothing but fade shots. Which is why his Thursday-afternoon back nine in this 46th Players Championship, in which he shot a two-under 34, was noteworthy. And one shot was particularly noteworthy. It was breezy, and the course was playing longer than it was in the morning, when Tommy Fleetwood took most of his 65 (seven under) strokes. The course is playing far longer this year than it was the last time the fellas gathered here, 10 months ago. It’s a March event again, after being played in May since 2007. As if often the case, the important shot had a preamble. On the par-four 15th, Woods tried to do something he almost never did last year: he tried to hit a hard, full release draw with the driver, the kind of shot you want to hit four or five or more times at Augusta National. He hit a crazy pull there that ricocheted off a pine and into a bunker 50 yards away, on the right side of the hole. That could zap a fella’s confidence. But then on the tee of the par-5 16th, he stepped up and went right back to the drawing board. Dude went in hit the hardest, into-the-wind, full-finish release-the-head driver you could expect to see from a man who’s fused. Was it vintage? No. Vintage has left the building and he’s not coming back. The move is still a little stiff. But it was impressive. It was something you did not see last year. The shot went 275, into the wind, and 20 yards past one of his playing partners, Webb Simpson. He was a few yards ahead of his other playing partner, Patrick Reed, one half of the Woods-Reed Ryder Cup dance team we all remember so fondly. It set-up a two-putt birdie, and he followed that with another on 17. Was it vintage? No. Vintage has left the building and he’s not coming back. The move is still a little stiff. But it was impressive. He signed for 70 and ended the day in a tie for 35th. He’s far closer to the cutline than the top of the leaderboard, but that’s not how Woods ever thinks and it would be half-shocking to see him miss it. Jim Thorpe was on to other things while Woods played the back nine. The 70-year-old golfing legend was on a busman’s holiday and following his friend Jason Dufner around the course. He would not have been pleased to see Woods sharing funny little moments with both his playing partners and all three caddies, but this is who he is these days. Woods’s people will tell you the new TaylorMade driver he is playing this year, the M5, is better-suited to hitting draw shots, but a more significant factor is finding a different shaft for this year, less grip heavy and more tip heavy. And then there was another keen, keen observer standing on the 18th tee: Jerry Pate, winner of this event in 1982, winner of the U.S. Open in 1976, host of the Jerry Pate National, a college golf tournament won by Woods in 1994, at Shoal Creek. Jerry Pate wants to see Woods’s left thumb right under the middle of the grip and shaft at the top of the backswing. Jim Thorpe wants him to cut the MC act. You likely have something on your list, too. In any event, he’s kind of in this thing, this glorified practice week for Augusta National. He’s going there thinking he can contend. Given where he’s been, that’s actually amazing.